You are reading this post from a device, amongst a slew of other content that has your (partial?) attention, in between a multitude of never-ending, ongoing, but seemingly essential digital conversations, and all of it comes amongst a day filled with key deliverables, more tasks, and bigger demands on you and your time. Which begs the question; Is the value of thoughtful, intimate face-to-face conversation between humans now DEAD? How do we make time, have the courage, or know the “right” way to connect deeply with the people in our lives? Join the Denver CreativeMornings community on November 10th at RMCAD, as we explore the death of communication, and learn from Debra Fine specific skills to develop and cultivate outstanding conversations so we can enjoy creative, connected, and bold lives. 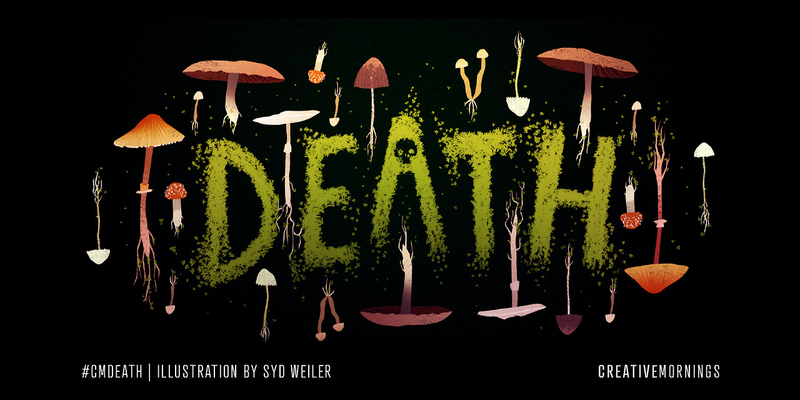 This month’s global exploration of Death is chosen by the Miami chapter and illustrated by Syd Weiler.